MUMBAI: The Reserve Bank of India on Monday granted an additional nine months for the public to exchange currency notes printed before 2005, including Rs 500 and Rs 1,000 denominations, and set a deadline of January 1, 2015. 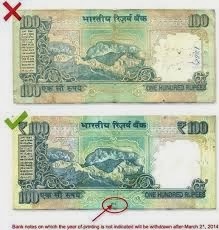 "RBI has also advised banks to facilitate the exchange of these notes for full value and without causing any inconvenience whatsoever to the public," the central bank said in a release. It clarified that the public "can continue to freely use these notes" for transactions and can unhesitatingly receive these notes in payment as all such notes remain legal tender. "A majority of such notes have already been withdrawn through the banks and only a limited number of notes remain with the public" the RBI said. Reserve Bank governor Raghuram Rajan had earlier said the withdrawal was not an attempt at demonetisation, nor had it anything to do with the forthcoming general election.